In Italian we say cambiamo casa: we are changing house versus the colloquial American “moving.” I like it. The Italian verb muovere is used for lots of things from “moved to tears” and taking legal action, to a dog wagging its tail, but never for the process of going to a new residence, hence changing house. Ric and I have been very busy changing house and thus there have been no posts to GoodDayRome and few to Our Weekly Pizza. External view at Via di Villa Emiliani. You can see my head in the window to the left of the balcony. Some of you may not know, but we are retiring later this month and staying in Rome: the plan is to remain here for two years to travel and enjoy before returning to Portland, Oregon. We had to leave our lovely apartment on Via di Villa Emiliani because it was provided by the Embassy and a new diplomat is arriving soon. Last October we embarked on a search for new place (that alone will be a future subject as it was a process unlike in the U.S.) and May 2 we picked up the keys. Janie will miss her sofa. No room for it at the new place as it is furnished. Libby is not happy with all of the changes and was giving me the stink eye as we organized for the move. She’s better now that she is in the new place. Artwork like this painting by my friend Mary Sawich is headed to the U.S.
Everything is labeled as to destination. “VRF” is an abbreviation of our new street. Our embassy community is a great outlet for selling furniture and we were able to unload sell almost everything we needed to: bed, desk, table and chairs, various cabinets, excess luggage, small appliances, etc. There are several churches involved in refugee relief and the local Episcopal Church, St. Paul’s Within the Walls, was able to take some things and referred me to another large relief organization that picked up dishes and other kitchen items we no longer need. When we get back to Portland my 13-year-old plates can be replaced. Then there are the things that it is hard to find a “home” for. They might be disposable or unwanted by us, but they might be treasures to someone else. A “garage sale” is unheard of, so we carefully set these items out by the curb to see if anyone would claim them. If they are still there in a couple of hours, we take the next step and put them in the trash. There are people who make a life out of “picking” and no doubt some of their treasures end up at Porta Portese, and there are neighbors who will claim a watering can, flowerpot or lamp. 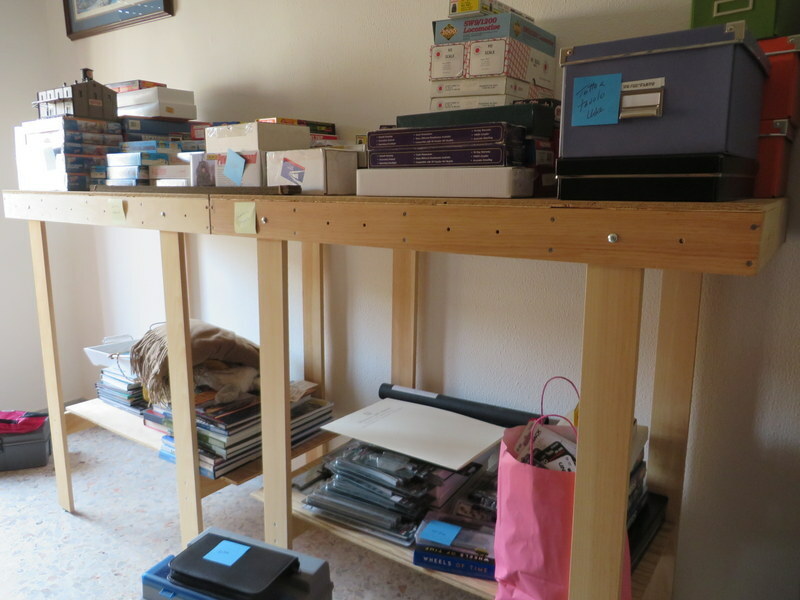 The train tables– two-of-four — momentarily used to stack things before moving. Items left curbside are retrieved by people who can use them. person who claimed it off the curb! He is, in his own words, un conservatore, a person who keeps stuff. Changing house in a city full of apartments with tiny elevators is fascinating. Balconies and windows become entry-and-exit points for boxes and furnishings. The team rolled in with a small truck (easy to maneuver in the narrow streets) and a lift vehicle that provided an outdoor elevator. In less than 4 1/2 hours they boxed or wrapped everything for the new apartment and loaded it on the truck. By 4:00PM they had everything inside the new one. 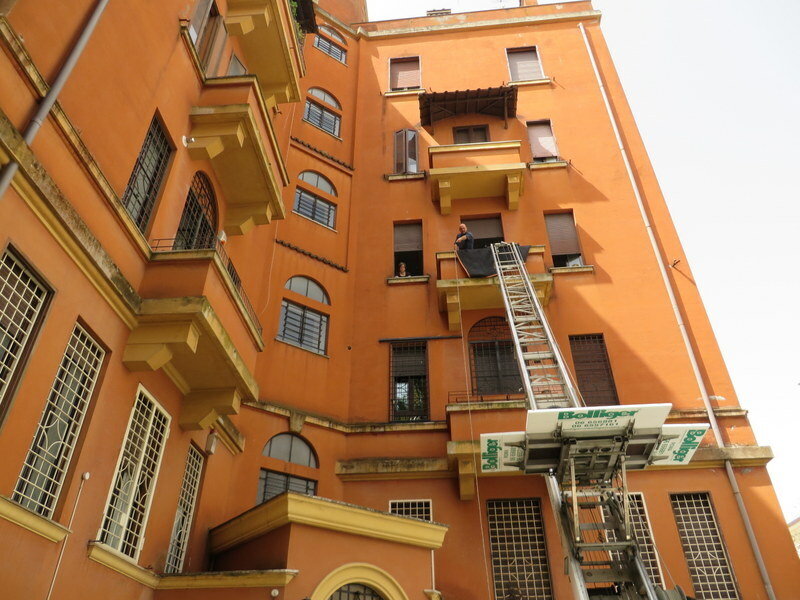 At each end the portiere (building superintendent) supervised the process. A second morning was devoted to packing up the items for storage in the U.S. Click on any photo for a slideshow and larger view. The living room in transition. We will miss this apartment! Lift truck in our courtyard. View from our tiny balcony looking down the lift. Putting boxes on the lift. Lift is loaded and ready to descend. The new apartment guest-room-office is not-quite-ready for occupancy. We are still walking through a warren of boxes. By Friday it should be better…. So as I write this it is early Friday morning. We are still not completely unpacked. The bedroom and bath are organized, but the kitchen is still in boxes and while most of the electronics are hooked up, the guest-bedroom-office is a dumping ground to be sorted out. We have 10 days before the first guest arrives so we need to kick into high gear. And we still have 7 days of work left before we retire. So we are establishing “Base Camp Barton” where the cats will reside while Ric and I travel, and many cat sitters have been lined up for the coming months. More later…. Congratulations on your retirement! You will love it. Looking forward to reading about your future travels. Thank you Grier. I will try to keep up. Planning a post on the new digs soon, now that the last box has been opened, emptied and recycled. Yes!! Best of luck, life and health in your new “home!” Really enjoyed your descriptions of “changing house!” Thanks for sharing…..
Grazie Susan! You have to let us know about Spain! I absolutely loved your description of moving, downsizing, ‘unloading’ things. And how they came and packed everything up for your move. I bet you’ll really like your new place (and so will the cats!). CIao Marcia! The cats have forgiven us for moving them as they now have a terrace for lounging that gets morning sun. I will write about the new place soon. We are definitely out of the American Embassy “bubble” and living local now! As always, an excellent post. Congrats on your successful move! Where are you located in Rome now? Gracia and I are planning a transatlantic next Spring with a few days in Rome. I will definitely contact you when our plans are complete – it will be fun to see you and Ric again. BTW, take a look at Gracia’s last post – she has a short bit at the end about refugees we stopped to help last Fall. Thanks Will. I did see Gracia’s post! Fascinating! We are still in Parioli, as we like the quartiere so much. No sense moving across town. We will look forward to seeing you in August in Seattle and next spring in Rome! Housewarming love your way! You write so well that reading about packing and unpacking is fun and interesting. Thank you!!! Some day perhaps you will come and see us! They have the same “lift” machinery for moving in Venice….but it arrives on a boat rather than a truck. I’ve seen a couple of them in my various meanderings around the city and I’m sure if my dream to live there comes true I’ll be employing their services. Happy new home! If I had the money for a ticket I’d offer to come cat sit….oh, wait, I’d have to pay someone to take care of mine….cat that is. How fun to imagine it done by boat! You should try TrustedHouseSitters.com for free cat sitters next time you travel! Thanks for the tip on sitters. 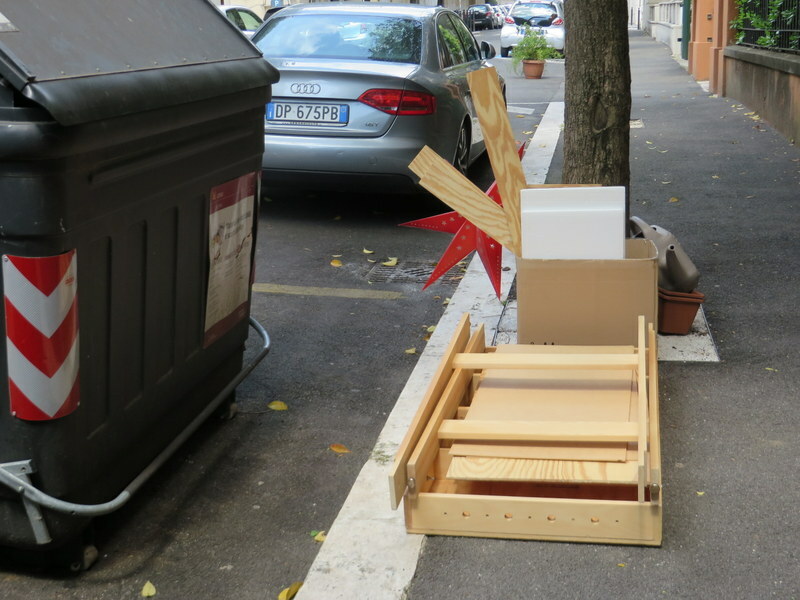 I checked out a local organization my last trip to Venice in December 2013 and they all either wanted a ton of money ($20 for 30 minutes to come feed and scoop the box) or one response was really creepy about staying in my apartment….figured either the place would be trashed or I wouldn’t be able to get her out. I finally talked to a coworker and he did a perfect job (paid him) and on weekends brought his two little girls to play with my cat. A good time was had by both cat and girls. I’ll check out your suggestion. As you know….everything in Venice is done by boat….they even barge in a truck with the mammogram machine! Felicitations for your “change of house”…wish JC and I could bring you a housewarming gift!! Maybe next trip. Also…happy retirement! Merci! We have 7 days left at work, which will seem easy after the work of moving!!! Hope to see you in August in Portland, unless you pass this way. Baci!